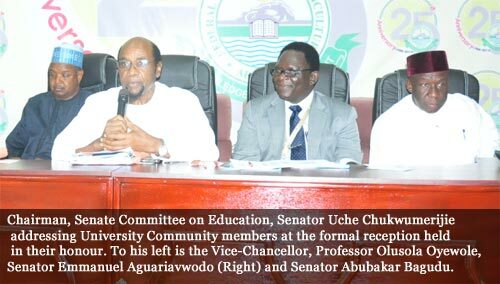 Members of the Senate Committee on Education, who recently paid a working visit to the Federal University of Agriculture, Abeokuta (FUNAAB), as part of their oversight functions, have lauded the University for maintaining a cordial relationship with its stakeholders. Led by Senator Uche Chukwumerijie, who gave the commendation during a formal reception held in honour of the Senators said; “we thank you sincerely for your warm welcome to this great Institution. Infact, the hospitality began right from the Lagos Airport, where your friendly Deputy Vice-Chancellor (Development), Professor (Kolawole) Salako welcomed us” on behalf of the Vice-Chancellor, Professor Olusola Oyewole. According to him, “we salute you for the spirit of partnership. This is what your hospitable welcome has demonstrated”. The Senate Committee Chairman added that, “with such evidence of a strong feel of oneness, we have no need to emphasise that our oversight tour is mutually-rewarding, as we jointly pursue a common goal of uplifting the Federal University of Agriculture, Abeokuta”. He charged the University to access its Tertiary Education Trust Fund (TETFund) allocation of N495 million, increase its Internally-Generated Revenue (IGR) by 100 per cent in the next two years, provide information on its sources of income and the amounts received in the last three years and send to the Committee, within the next two weeks. 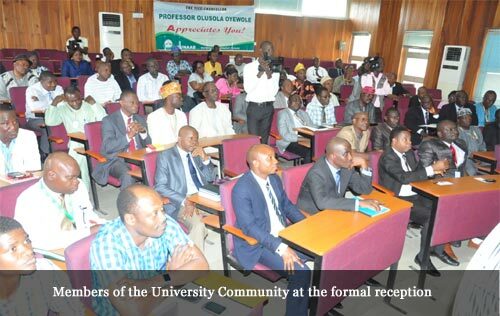 Earlier, the Vice-Chancellor, Professor Olusola Oyewole, had paid glowing tributes to the past Vice-Chancellors of the University, which include Professor Julius Okojie, who is the current Executive Secretary, National Universities Commission (NUC). He added that the present Deputy Speaker, House of Representatives, Rt. Hon. Emeka Ihedioha, is also an alumnus of FUNAAB. 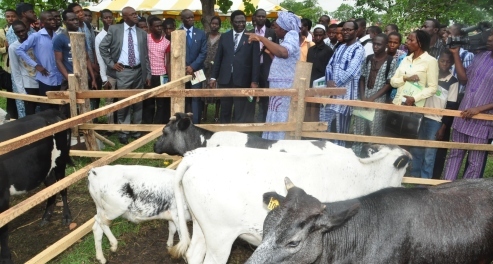 The Vice-Chancellor stated that the University has a land mass of about 10,000 Hectares, a tripodal mandate of Teaching, Research and Extension, over 50,000 students both at the undergraduate and postgraduate levels and runs a Community-Based Farming Scheme (COBFAS), which had impacted the various neighbouring communities positively. Professor Oyewole, who is also the President, Association of African Universities (AAU), expressed gratitude to the Senators for their unflinching support for the University, stating that the Personnel and the Overhead Cost of the University were 100 per cent utilized while the Capital and Intervention Funds were under-utilised. He commended the Federal Government for establishing TETFund, saying that it had really assisted the University in its internationalisation drive as “over 200 staff of this University had been exposed internationally and we don’t want to be a local champion”. The Vice-Chancellor, however, requested the Senators to facilitate the three important things he would want the government to do for the University: Empowering the University to employ more academic staff to meet accreditation needs, provision of a turbine to generate electricity that will cost about N1 billion and the construction of a dam to provide regular water supply on campus at a cost of N900 million. Professor Oyewole added that even though the University had sunk over 72 boreholes so far, they had not yielded much as expected, as he stressed the need for adequate investment in education in the country. Meanwhile, Senators Abubakar Bagudu and Emmanuel Aguariavwodo re-stated the Senate Committee on Education’s passion in ensuring the development of the nation’s education sector, adding that if FUNAAB could continue to do things creatively, it had what it takes to be among the leading Universities in the world.